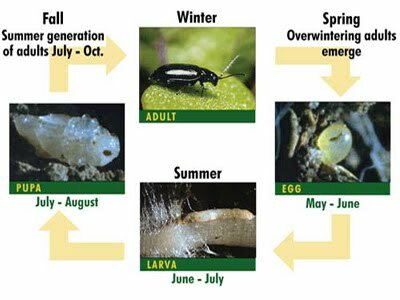 Life Cycle: Flea beetles are very crop specific. Discussed in this article will be the two major flea beetle pests on crucifer crops, the Crucifer Flea Beetle and the Striped Flea Beetle. Adults of both species overwinter in edges, mostly thick duff, forest edges, and shrubby areas around fields where host crops are grown. Adults emerge in the spring and immediately begin feeding on host plants. Beetles come out over several weeks. Females begin to lay eggs in the soil at the base of host plants a few weeks after feeding. Larvae hatch and feed on root hairs. This stage of feeding is usually not damaging to plants. Larvae pupate into adults after about a month. There are usually two, sometimes three generations per year in warmer climates and one generation per year in northern climates. Striped Flea Beetles emerge slightly earlier than the Crucifer Flea Beetle. 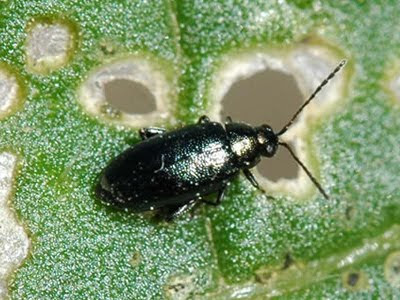 The adult Crucifer Flea Beetle is black and sometimes metallic looking. The Striped Flea Beetle has two light yellow stripes, one on each side of its back. Plants effected: Cabbage, broccoli, Brussels sprouts, Chinese cabbage, radish, daikon radish, pak choi, bok choi, and other crucifer crops including weed plants in the crucifer family like yellow rocket and wild mustards. Insect Habit: Adults are strongly attracted to crucifer crops. Flea beetles are very powerful fliers and hoppers, jumping like fleas when disturbed. They easily find host plants in the spring; first feeding on weeds, like wild mustards, in field edges and then enticed to younger crucifer crops as soon as they emerge. Feeding occurs on the edges of waxy-leafed crops and as shothole feeding on less waxy crops. Beetles feed heavily during the first weeks of summer. As overwintering adults die off in mid-summer, feeding pressure is reduced. Emerging adults feed before moving into field edges for the winter. 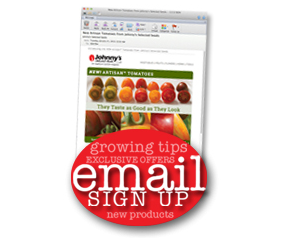 Host plant pressure may increase in the later months of the summer, and, in warmer climates, into early fall months. This pressure is not as intense as the early-season feeding. Control: Row cover is, by far, the best protection against flea beetle pressure. In conjunction, reducing weeds on field edges, rotating crops, and keeping shrubs (reducing thick leaf litter) to a minimum along field edges will help keep flea beetle pressure lighter than it otherwise could be. Planting crucifer crops after overwintering adults have died off is an option but difficult if crucifer crops are desired as an early crop. Row cover placed on crops as they are seeded or at the time of transplant is essential. Flea beetles find transplants and emerging seedlings very easily. Use Agribon+ AG-15 Insect Barrier (#9057, 9051 or 9050 – depending upon space needing coverage). Insecticide options include Pyganic® (#9192, 9532), Liquid Rotenone-Pyrethrin Concentrate (#9336), and for radishes Entrust® (#9068). 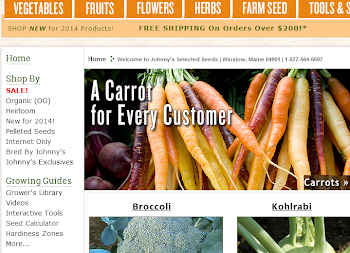 Read all product labels in full and follow label instructions as specified for that particular product.